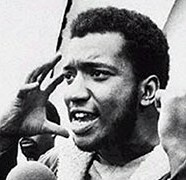 Fred Hampton, 21, a prominent member of the Black Panthers was gunned down by 14 police officers along with fellow member Mark Clark, 22, as they lie sleeping in their Chicago, Illinois, apartment. Police claimed to kill the two in what they termed a fierce gun fight with the Black Panthers Party. Ballistics reports, however, would later show that only one bullet was fired from the apartment. Four other Black Panthers were wounded in the raid, as were two police officers. Hampton had become involved in the civil right fight early on, organizing a chapter of the NAACP at his high school when he was only 15, and became chairman of the Illinois Black Panther Party at age 20.